Picturing Mary, a stunning high-definition documentary that explores how for nearly 2000 years, artistic images of the Virgin have reflected a variety of traditions, devotional practices and cultures across the globe. The one-hour program takes viewers on an artistic journey through history from the earliest times to the present day, offering a visually stunning array of art from twelve locations in eight different countries. The documentary is narrated by actress Jane Seymour and features quotations read by actor James Keach. Almost all of the artworks featured in Picturing Mary were filmed in situ, in the original settings where they were intended to be viewed in Europe, Africa, America, and Asia, just as they were hundreds of years ago. Those settings include the Basilica of Santa Maria Gloriosa inVenice, Italy, where we find one of the greatest paintings of the Venetian Renaissance, Titian’s 22-foot-high "Assumption". 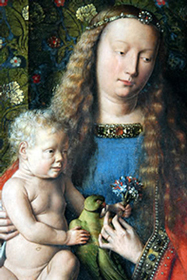 In Bruges, Belgium, Jan van Eyck used what was then a new medium – oil painting – to astonishing effect on full size pictures of Mary. In the Dutch city of Amsterdam, Rembrandt van Rijn created hundreds of etchings, prints and drawings, establishing himself as the greatest illustrator of Scripture ever. Devoted to realism, Rembrandt depicts Mary in "Death of the Virgin" not as the lovely youth often seen, but as a sick old woman. 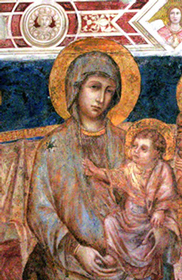 Through the use of the latest widescreen high definition technology, from the Basilica of Our Lady of Guadalupe in Mexico City, to Istanbul, Ethiopia, and beyond, Picturing Mary allows viewers to make virtual visits to some of the world’s greatest masterpieces by some of the world's greatest artists, including Simone Martini, Lippo Memmi, Duccio di Buoninsegna, Cimabue, Giotto di Bondone, Titian, Jan van Eyck, Michelangelo Buonarroti, Rembrandt van Rijn, Caravaggio, and many others. Picturing Mary is narrated by actress Jane Seymour and features quotations read by actor James Keach. A multiple Emmy and Golden Globe winner, recipient of the Officer of the British Empire (OBE) in the year 2000, which was bestowed on her by Queen Elizabeth II at Buckingham Palace, Jane Seymour has proven her talents in motion pictures as well as on Broadway and television. James Keach has worked as an actor, writer, producer and director. His recent credits include serving as producer for the Academy Award-winning "Walk the Line" and the comedy "Wedding Crashers." Keach executive produced and co-wrote the feature films The Long Riders (in which he also starred as Jesse James) and "Armed and Dangerous." Fall 2006 – Kristin joined the production team as the PBS station strategist and advocate with the goal of securing as many broadcasts as possible for "Picturing Mary" during the month of December, especially around Christmas. Following the film's highly successful national television debut, Kristin was put in charge of taking the film out on the international film festival circuit. "Bill Baker called me today about his upcoming project, “Picturing Mary.” He wants you on it, says you’re the best, and I agree." There were well over 300 Christmas Week broadcasts of "Picturing Mary" and the documentary aired in 24 of the top 25 markets. "Picturing Mary" continues to receive waves of broadcasts, especially at Easter and Christmas. To date, "Picturing Mary" has had more than five thousand, five hundred broadcasts across 94.85% of the US, making it accessible to well over one hundred million television households nationwide. "Thanks for your fine report... very much appreciate your skill, professionalism, and energy, Kristin." In November 2007, "Picturing Mary" received a "Programming Excellence Award" from American Public Television in acknowledgement of the stand-out amount of prime-time broadcasts the documentary received, making it one of most successful programs in APT's entire 2007 catalog. "You are terrific. Thanks for everything." Nominated for an award in the "Art & Religion" category at the Religion Today Film Festival, Milan Italy, October 2007. "Such good news – another award nomination... Kristin, can I just say what an amazing job you are doing with all the Film Festivals!" 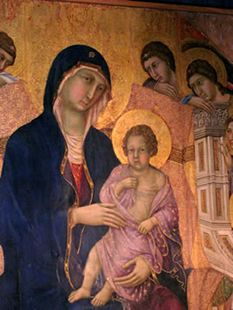 writer & producer, "Picturing Mary"
Detail from Cimabue’s altarpiece in the Basilica of St. Francis in Assisi, Italy. Picturing Mary is a production of Thirteen/WNET New York and The Edge Facilities, Ltd., in association with USCCB. Picturing Mary was produced by The Edge of London, England. The documentary was directed by Martin Johnson and produced by Rosemary Plum. The director of photography is Chris Hartley and the music was composed by Matthew Scott. William F. Baker, PhD, (former) President and General Manager of thirteen/WNET in New York, the largest PBS station in the system. Currently, Baker is Executive in Residence at Columbia University School of Business, Journalist in Residence at Fordham University and the Claudio Aquaviva Chair at the Graduate School of Education, and President Emeritus of Educational Broadcasting Corporation, parent company of WNET-TV (Channel Thirteen) and WLIW-TV (Channel 21), where he served for 20 years as Chief Executive Officer. He has been called an icon of public television for producing some of the industry’s most respected and popular programs, including Charlie Rose, Bill Moyers Journal, Nature, Cyberchase, and Great Performances. Among numerous honors, he has won seven Emmys and two Columbia Dupont Journalism awards, and was named to the National Academy of Television Arts & Sciences' Management Hall of Fame and the Broadcasting and Cable Hall of Fame. In 2008, he was appointed as a senior research fellow at the Hauser Center for Nonprofit Organizations at Harvard University. Prior to public broadcasting, Bill Baker was President of Westinghouse Television and Chairman of Group W Satellite Communications for almost a decade. During his tenure as Chairman, the Discovery Channel and the Disney Channel were launched. He also got Oprah Winfrey started as a television talk show host. Frequently sought out as an expert on the media, Baker is also the author of "Down the Tube: An Inside Account of the Failure of American Television" (Basic Books, 1998) and the executive producer of the documentary film, "The Face: Jesus in Art.